Church Micro in Minster, Sheppey. Founded as a nunnery by the widowed Queen Sexburgha in 664AD it was endowed with land given by her son Ercombert, King of Kent. With no stone on the island the building material was hewn at Boughton Monchelsea and brought down the River Medway and the Swale. The priory was badly damaged, but not destroyed, by Danish Vikings in the ninth century and was further damaged in the 11th century. 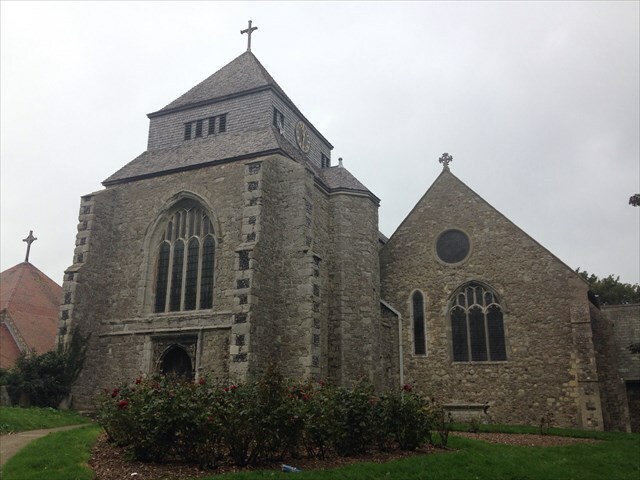 Following the Norman invasion of 1066, King William the Conqueror partly rebuilt the church and priory and allowed nuns from Newington to take up residence. Repairs to the church were neglected in the mid 19th century, but Rev William Bramston restored the church in 1881 and the Abbey is now a Grade 1 listed building. The western tower which now holds the bells was only added in the 15th century. Originally planned to be much higher at 130ft the troubled times of the Reformation discouraged the builders and the belfry and roof are disproportionate to the base. The tower originally had a peal of five bells cast in 1663. A sixth, treble, bell dating from 1602 was added from the church at nearby Warden which fell victim to coastal erosion. The bells were re-cast and re-hung in 1927. The final is a 5 minute walk, or could be driven, but mind the terrain! At GZ you will be rewarded with impressive views in addition to the views from the Abbey.